When the Walt Disney World Resort opened on a former bit of Florida farmland back in 1971, few could have predicted just how vast and lucrative a holiday destination Orlando would become. These days World Disney World is home to four distinct theme parks, The Magic Kingdom, Epcot, Hollywood Studios and Animal Kingdom, and two water parks, Typhoon Lagoon and Blizzard Beach. Imagined on an even bigger scale that California’s original Disneyland, the Magic Kingdom is Disney as we’ve seen it in the adverts, where characters including Mickey Mouse cheerily greet visitors in the shadow of its central fairytale castle. Undoubtedly it’s the park best suited to small children, there’s plenty for the adults to do, with a constantly updated selection of high tech rides and performances. Epcot is something altogether different, albeit still presented in a very clean-cut Disney style. This park celebrates technology, science and world cultures, with one of its big draws being the fascinating World Showcase, where different regions of the world are depicted in their own separate areas around an attractive lagoon. Those on the hunt for something that will get the adrenaline pumping may prefer Disney’s Hollywood Studios, home to the tense Twilight Zone Tower of Terror and the Rock 'n' Roller Coaster. Disney’s Animal Kingdom Park brings wildlife from across the world into a theme park setting, with African and Asian adventures that include everything from jeep safari tours to animal-inspired roller coasters. Then there’s the waterparks, Typhoon Lagoon and Blizzard Beach. Blizzard Beach is your best bet for thrilling slides and rides, while Typhoon Lagoon boasts North America’s largest wave pool, where you can catch some waves on surf board. But it’s important to remember that Disney is not the only act in town, with Universal Studios and sister park, Universal Island’s of Adventure, also providing a big draw. The original Universal pitches itself as “world’s premier movie and TV based theme park” with impressive attractions such as The Wizarding world of Harry Potter and Despicable Me Minion Mayhem. Island’s of Adventure is home to some of the more thrilling rides, such as The Amazing Adventures of Spider-Man, as well as some magical child-friendly zones. 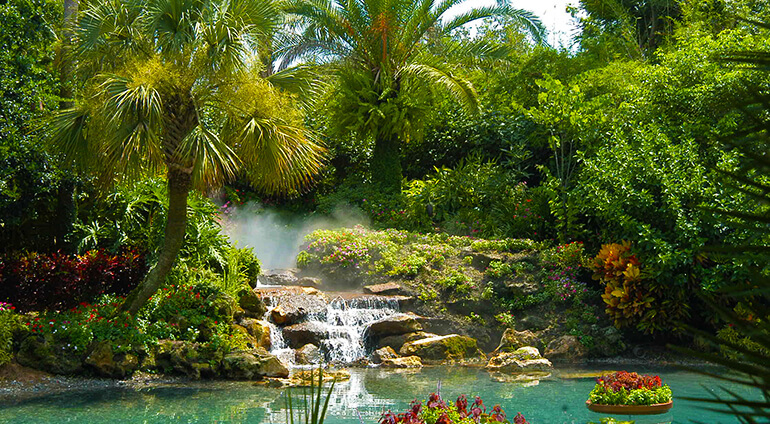 For something different try Gatorland, a family-run theme park and nature reserve that’s been open since 1949 where you can see hundreds of alligators in a breeding marsh, as well as some brilliantly special effect free shows. If you need a break from the constant ambush of attractions, you can take a trip back in time to Old Town Kissimmee, home to Americana themed shops and restaurants and the All American Muscle Car Cruise, or check out Celebration, the Disney created celebration of small-town America that’s so perfect it’s almost eerie.